﻿Heavy metal music saves Norwegian boy from wolves User Rating:	Of & / 35 Thursday. 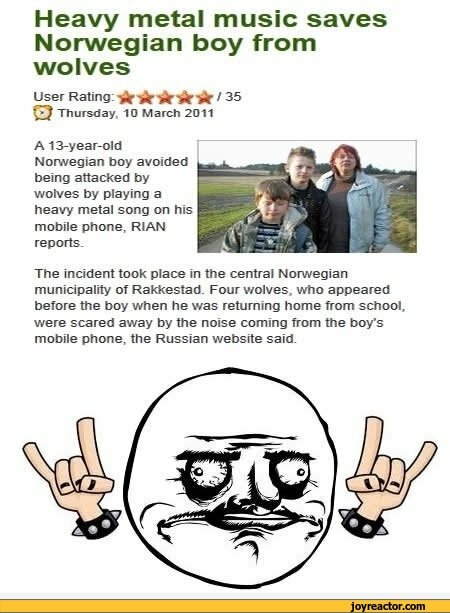 10 March 2011 A 13-year-old Norwegian boy avoided being attacked by wolves by playing a heavy metal song on his mobile phone. RIAN reports. The incident took place in the central Norwegian municipality of Rakkestad. Four v/olves who appeared before the boy when he was returning home from school, were scared away by the noise coming from the boy's mobile phone, the Russian website said.